Haunted by memories, you hope there is just some small oversight…some simple communications problem, but you know, deep down, in the back of your mind…THEY’RE BACK!!! Face huggers, chest bursters, dog aliens, adult aliens, ruthless corporate shills, and…3 Queen Aliens! Over 30 acid encrusted levels, an arsenal of lethal weapons, and you! 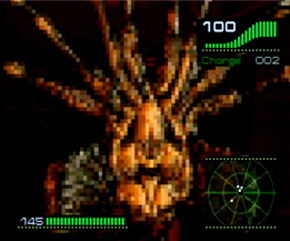 All the gut-churning 3-D action of the complete Alien Trilogy in one black-death, white knuckle nightmare. 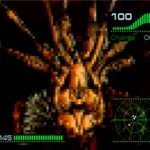 You have to give Doom credit: if there was ever a game that would spark a creative frenzy in the gaming community to try and create the next killer app that would try and topple the originator, Doom was it. When the PlayStation began hitting its first year stride in 1996, there had already been a LOT of copy cats flooding the market. Fox Interactive decided to try their hand at the clone tool and attached one of their most precious movie licenses, Alien, to the mix and see what happens. The gamble paid off, and gamers got a fun romp through Ripley’s worst nightmare. 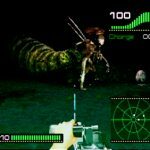 Players take on the role Lt. Ripley as she makes her way to space colony LV426 to investigate and crash an alien egg laying party. Along the way she’ll take on face huggers, aliens, dog aliens, adult aliens, even evil corporate bastards trying to keep the acid dripping monsters alive. If you’ve ever wanted to take your frustration out on a corporate entity, now’s your chance. Referencing Doom means we’re talking a First Person Shooter (FPS) type experience, and it’s a kicker of a journey. 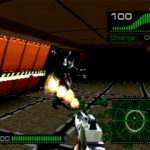 All of the requirements of early FPS games are represented; shot guns, pistols, big weapon, huge weapon, hordes upon hordes of targets, hidden doors, lost items, and the uncanny feeling you’re about to get slimed. The game does a great job bringing the player into the environment, except that it does it a little too well at times. This experience is dark; really, really, dark. So dark that at first glance you think your TV’s brightness knob is busted. With a little fiddling, you can get the brightness to a more respectable and playable setting without ruining the mood of the game. While the levels are polygon based, the creatures and human enemies are sprite-based, and both do a fine job. I’m actually surprised how well the level visuals held up after all this time. One of these days I’ll get back a save I know I have somewhere and finish the damn game. Essentially the only kink in the armor is that certain level layouts make no sense, and will have you running in circles for a while. You owe it to yourself to check it out. Just watch out for the face huggers. Also available on Sega Saturn. The game was released in variants, please see below for the jewel case and Greatest Hits versions. Currently only long box known is the Saturn style. Observation: You as a single person armed with essentially nothing but a pistol have to clear out an entire alien infestation so the SPACE MARINES can come in and tidy up afterwards. Sounds…lazy on their part, doesn’t it? Insert the CD into your PC, and view the files. You should see a folder marked Language. Click on that, and open the “missionu” text file. You can now view the entire mission log that you would normally see before each stage begins. 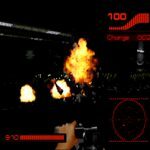 All three versions of the game (PC, Saturn, PSX) more or less have the same Programmer Cheats, but the codes needed to activate them are all completely different. 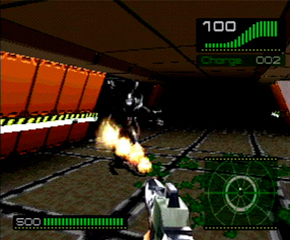 The PlayStation version has the easiest version to work with, between the consoles. 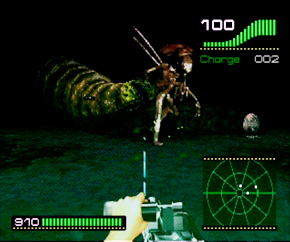 Probe also developed the first Die Hard Trilogy. CD supports red book audio. Place the CD into your music player, and skip to Track 2 to hear the soundtrack. The original long box case does not mention the Memory Card in the icon section. The game does indeed support the Memory Card, and this oversight was corrected on the Jewel Case and Greatest Hits packaging. One of the very few games to offer in-game Memory Card management. You could delete data / format the card while still in Alien’s Option Screen. Pat Sones, whose only voice-over work was in this game, is more commonly known as a Hollywood ‘Location Manager’, and has worked as a crew member on such films as The Hours and Requiem for a Dream. 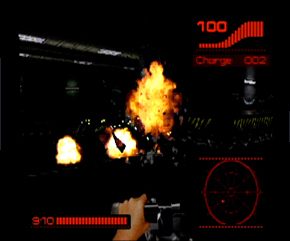 Jeffery Lee Gibson performed several motion stunt captures for the game. He has worked on and coordinated feats in a lot of Hollywood productions.